Like I mentioned on my Blade helicopter page, the Blade Nano CP S could be one of the best micro sized collective pitch RC helicopters for indoor flying fun - period (when bound to a computerized radio naturally). I've been having indoor fun with my original Blade Nano CP X for several years now, and the newer S version simply improves on what the X version already did well with the addition of SAFE technology for beginner pilots right up to pro, even including a rescue mode. I must admit, I had kinda lost interest in micro sized CP helis over the past few years simply because I enjoy flying my larger birds so much more. However, recently being grounded by Transport Canada's ridiculous and overreaching RC flying regulations that apply to all RC aircraft that weight over 1/2 lb (250g); I've been forced to dust off my micros. Much to my surprise, I'm actually having lots of fun with them once again; indoors, the Nano most of all! The Blade Nano CP S is so well suited for indoor flying, even in fairly modest sized rooms. It really is the perfect size for this environment due the fact it gets really small, really fast when flown outdoors in larger areas. This little micro CP heli can of course be flown outdoors and even handles light wind with fairly decent power and stability. Nothing at all like taking your little micro coaxial outside in a light wind. With SAFE technology in Stability Mode, the Blade Nano CPS is actually a very easy CP heli to progress to from a micro coaxial like the very popular Blade mCX2. For added beginner protection, the Nano CPS as seen above can even be fit with a set of micro training gear for those that feel the added stability in beginner mode is still not enough "training wheel" help. Training gear of course gives added visual presence, and on a micro sized CP heli like this, will allow one to detect small pitching and rolling changes before you could see such movement on the helicopter. This allows you to make control corrections both faster and more accurately. Not really a big deal in Stability Mode, but can be a beneficial help when trying Agility Mode or Stunt Mode, where the self level stability mode feature is turned off. What I really like about the Blade Nano CP S & X, is their low weight. As most of you know, low weight on a micro heli = low energy release when it crashes. I talk about this all the time as one of the benefits of learning on micro helis, and the Nano is no exception to this rule. Provided you power down before hitting something (engage the throttle hold toggle), this little bugger generally just bounces off the wall or whatever, falling to the floor without any damage. Of course, much depends on how fast you are flying and how it hits and how hard the item is that you hit; but more often than not, as long as you power down the heli, damage is unlikely. If you don't power down, the feathering spindle will almost always get bent I have found, and is a good spare part to have on hand (BLH3313). When damage does occur however, take comfort in the fact that parts for the Blade Nano CP S are readily available and also low in cost. Also on the "parts" note, like with all micro sized helis; I strongly recommend staying away from costly and heavy aluminum upgrade parts on the Blade Nano CP S. There are lots out there, and all they usually do is add weight which puts more strain on the heli, reduces flight time, and almost always results in more crash damage. Like the original Nano CP X, the S version is basically the same overall design. 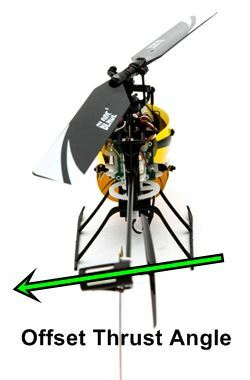 A light weight plastic frame is used along with carbon tail boom, plastic landing struts/skids, and poly-carbonate canopy which thanks to its yellow and black paint scheme make it easy to see - a very good thing considering the small size. The "brains" are mounted on a small combination control board that we have all become familiar with on Blade's micro RC aircraft. 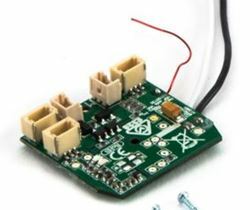 This board includes the DSMX receiver circuitry, the ESC (electronic speed control for both main motor and tail motor), the tail mixer, and of course, the electronic flybarless stabilization components with the updated SAFE technology. Main and tail motor are small brushed coreless motors and servos are customary micro linear directly driving the 3 swashplate quadrants to give collective, cyclic pitch, and cyclic roll movement. The swashplate has the ears spaced out at 140 degrees. 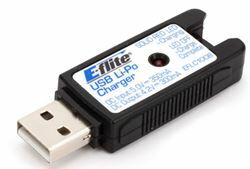 Charging the 1S 150 mAh LiPo battery is now done through an included USB mounted charger over the single cell eFlite charger which needed 4AA batteries to power. This makes perfect sense with the abundance of USB power outlets making their way into our homes and vehicles. Perhaps the most interesting design aspect of the new Nano CP S, is the tail motor axis is tilted slightly up from a level/horizontal thrust angle. The tilt angle however is perfectly level once the heli is airborne and leaning slightly right to compensate for the left tail rotor translating tendency. This allows much better pirouette maneuvers without the heli drifting as much compared the original Nano X. The Nano is surprising stable given its small size. This of course is thanks to the FBL stabilization gryos and with the addition of accelerometers for SAFE in Stability mode, further tames things down. That said, I found cyclic & tail response off mid stick a little too "reactive" for my taste and adding some positive exponential to the 3 main control channels (aileron, elevator, & rudder), really helps. The instructions actually call for +25% Expo in all flight modes, but I found for normal type flying in Agility mode, going even higher up to +35% can really "soften" mid stick response. Not everyone will like those high Expo values of course, but I encourage you to experiment to get this little rascal behaving exactly how you want it. This is after all the beauty and power of a computerized radio, use it to tune the output to what you like. Speaking of computerized radio setup values, the suggested values in the instructions are pretty good, but again, depending on how one likes the overall feel and response, should be considered starting points. I for example like more dual rate reduction on the tail in agility mode (my "normal" flying mode). 50% dual rate on tail and 60% on both cyclic channels seems perfect to me for normal flight while in Agility mode, but we are all different in how we like overall response. In stunt mode, of course that gets dialed up to 100% for full cyclic and tail response. 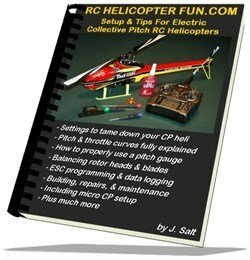 I go over all these setting in more detail along with checking the actual collective pitch range in the micro heli section of my Setup & Tips eBook. If you fly with the DX6i, which only has a 2 position flight mode toggle, you can of course only select two of the three modes. Flight mode activation is mapped out to channel 5 (gear channel), and depending on that channel's output, will dictate what flight mode the heli is in: Stability, Agility, Stunt, and Rescue. So, you can start with Stability Mode and Agility mode on the 6i, and then once you feel comfortable flying in Agility mode, then change your channel 5 output to activate only Agility & Stunt. Radios with 3 position flight mode toggles of course allow access to all three modes. You can of course customize throttle curves and pitch curves in all flight modes independent of what level of SAFE stabilization is selected. You for example don't have to run a -3 to +10 collective range in Stability mode if you don't want to. You could run that in your Agility mode range for a "normal flight" mode and only use -10 to +10 in the Stunt mode pitch curve as just one example. What I'm getting at here is don't confuse customary collective pitch flight mode programming with the amount of flybarless stability help. Both are completely independent from one another. In short, don't limit yourself to thinking you can't run a tamer setup if you so choose in agility or stunt modes when the level of accelerometer help in the FBL system has been reduced or turned off. This will also better prepare you for larger CP helis and their full function programmable FBL systems, both in terms of setup & understanding. Flight times of the Blade Nano CP S can vary wildly depending on your setup and of course how you fly it. Flown hard with a full powered, flat line 100% throttle curve, don't expect much over 3 minutes maximum! Flown tamely with nothing much over a 75% throttle output on the curve, you can milk just over 6 minutes out of it using the included 1S 150 mAh LiPo.